No strangers to farm life, our family has always loved farming and animals. After several years of talking about starting a farm, we began to study up on sustainable farming as well as visiting several other farms. We collected valuable information and stories along the way. Most of the farmers we met said the same thing: "You just need to jump in and start….get farming!" So, we did. In 2014, we found the perfect farm. Mom and dad were the first to move to the farm during Christmastime. Tiffany and Neil came next in April of 2015 and Heather moved back from South Carolina in July of 2017. When our family took over the farm, it had not been a working farm for over 30 years. Needless to say, it needed a lot of love! Over the last three years, we have brought the farm back to life by filling the barns with animals, the land with crops and the farmhouse with our family. Terry (Dad) loves land, agriculture and watching the fruits of his labor prosper at Harvest Bell. He has been the driving force behind restoring the farm and much of its beauty is attributed to his vision and hardwork. An animal lover, Lillian (Mom) thrives on the farm. She loves having her family and animals around her at all times. You can almost always catch her at our Saturday Farmer's Markets. 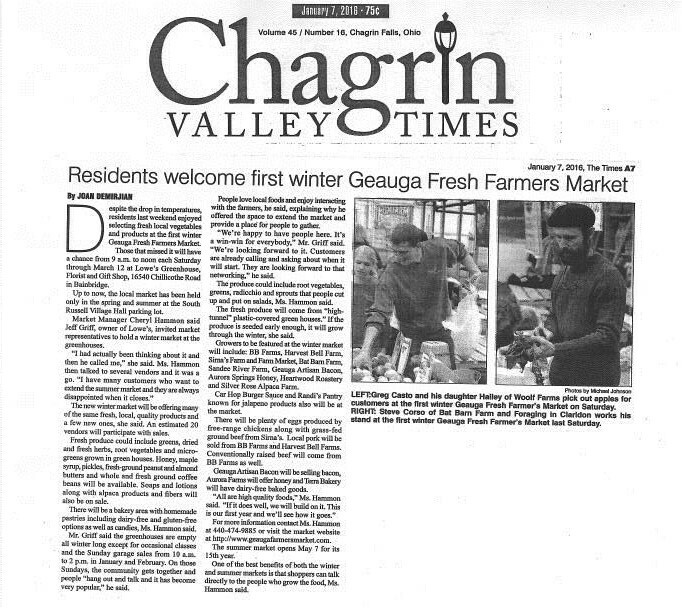 As a native of the Chagrin Valley area, Lillian has been able to connect the farm with a multitude of friends. Tiffany adores animals, and her humanitarian philosophy has put purpose behind what Harvest Bell does. Where Terry is the driving force behind the land and buildings, Tiffany is the driving force behind the care of our animals and the way we market our product. Her enthusiasm and diligence have helped make a name for Harvest Bell in the local community. Neil knows the value of farm-raised foods which has helped the farm build relationships with a host of local businesses and organizations. Neil is also our master craftsman on the farm. If there is a structure that needs fixin or new coops for the chicks, Neil is our man. A school teacher by trade, Heather was always our resident farm girl each summer on Harvest Bell. But now that she is here full time, her helping hands have been as asset as the farm continues to grow. We also put her creativity and artistic talent to good use on the farm. Lastly, Nany (our grandmother) has recently moved to the farm making Harvest Bell a farm of three generations. As we continue to learn, strengthen, and grow, we can't wait to see what the future will hold for Harvest Bell Farm and our family. We look forward to sharing our journey with you. Harvest Bell Farm was originally started in the 1950's and was known as the Fisher Dairy Farm. Today, Harvest Bell Farm is a family farm focused on the health and wellness of the families around us. We believe in sustainable, ethical and natural practices. Our goal is to provide naturally raised livestock and fresh crops. The farm is nestled in beautiful Newbury, Ohio where we have 20 acres to let our animals be completely pasture-raised. At Harvest Bell, we raise our animals in a humane, stress free environment. They have a constant supply of fresh water and enjoy the freedom of being outside in the sunshine and eating up nature’s offerings. In addition to nature’s offerings, our animals have a steady supply of fresh NON-GMO feed. We don't use animal by-products, antibiotics or other non-natural feed additives. Our grandparents first purchased this bell in 1968 and since then, the bell has followed each of us on our journeys to finally rest at Harvest Bell. Copyright © 2017 Harvest Bell Farm - All Rights Reserved.